The FIVE men that can WIN Kona in 2014...? Tri247 Editor John Levison puts the crystal ball predictions and opinions on hold (temporarily), to see if a purely statistical approach can help pick an Ironman World Championship 2014 winner. I wrote an article very similar to this two years ago, and it generated quite a debate. Some thought it was interesting, others thought it was garbage, many took to contacting me with "but you've forgotten athlete X, Y, Z" - and a few people thought I didn't have a clue what I was talking about! But, ultimately, I suppose it proved 'correct' in one sense - in that it said, based on the data reviewed, one of only five men could win Kona in 2012 (based on this analysis only...! ), and one of those - Pete Jacobs - did win. In a just over a week, Saturday 11th October to be precise, the 2014 Ironman World Championships in Kona will be run and won. That means of course that the triathlon world - athletes, media, fans, coaches - will start the annual prediction-fest for the Kona podium. Who is in form? Who's got the experience? Is Crowie too old? Can Jan Frodeno walk in and waltz off with the title at the first attempt? Can Van Lierde defend? And on, and on. And, that's great. It's fun, and it's not an insignificant part of what I've done myself on Tri247 over the last seven or more years. I'm sure I'll be doing more of that before Kona too! Every year I hear that it's 'the strongest field ever' or 'the most open race' or 'difficult to predict, any one of 15/20 or so could win'. But... I think that's rubbish. At least it is based on statistical history. How many, and who of the men's start list for Kona 2014 can WIN the Ironman World Championship this year? That word 'WIN' is very important here. For this analysis, I'm not assessing who can be competitive, or who can impact the race, or who could make the podium - it's solely focussed on identifying the potential winners. Ignoring the "past performance cannot be used to predict future performance" warnings of an investment commercial, I'm going to try just that approach. For example, when Normann Stadler won his first title in 2004, his previous best performance was third (in 2000), while the previous year (2003), he had finished fourth. When he won again in 2006 his previous best was, of course, winner but his 'previous year' results was a DNF - Too much glue! Over the past 25 years only 12 men have won an Ironman World Championship. Of those 12, seven won the title at least twice in that period (58%). In the last 25 years, only one athlete (Luc Van Lierde, 1996) has won on their debut in Kona. Excluding that Van Lierde debut win, in 25 years no man has won Kona who hasn't finished at least fourth previously. Of the champions that hadn't previously won (and excluding the Van Lierde debut), seven had previously finished second, three had placed third and only one (Peter Reid), won with a previous best of 'only' fourth place. 13 of the 25 years (52%) reviewed were won by previous champions. 6 of the 25 years (24%) reviewed were won by the defending champion. Of the 11 first time winners (excluding the Luc Van Lierde debut win), 8 (73%) secured their best previous result the year immediately prior to that first win. To add to that, only once in the last 17 years has a first time winner not had their best ever result the year immediately prior to their first victory. (Normann Stadler won in 2004 with a previous best of third in 2000). 96% of Kona winners in the last 25 years had previously finished fourth or better - only Luc Van Lierde's 1996 debut win fails this test. 92% of Kona winners (23 out of 25) in the last 25 years had previously made a Kona podium (top three). It is 16 years since an athlete won Kona who hadn't previously finished in the top three - and Peter Reid proved to be rather special, winning the race three times in his career. He finished fourth in both 1996 and 1997 prior to his first victory in 1998. You need to be exceptional - not many men win an Ironman World Championship. Ideally, make sure you've already won it before! Ensure you have finished at least fourth before, but more realistically that you are a previous podium finisher (second/third). If at all possible, have finished in the top five - more likely top four - last year. Once you've done well and got that podium, win it for the first time the following year if you possibly can - the window of (winning) opportunity is small. Possibly - but unlikely - make an exceptional debut. (Luc Van Lierde broke the Kona course record in 1996). There are four previous Kona Champions starting this year: defending champion Frederik Van Lierde. 2012 champion Pete Jacobs, three-time champion Craig Alexander and 2005 winner Faris Al-Sultan. Faris Al-Sultan has finished 11th / 10th / 10th / 10th / 5th / 10th (2008-2013) inclusive. That is incredibly consistent Kona performaces, but is it indicative of Kona winning form in 2014? It is now nine years since his best Kona performance (win), and so based on the numbers that rules out Faris based on these statistics. Frederik Van Lierde, of course, is a potential winner - defending champion and in good form with second at Ironman Frankfurt ticking all of the 'statistics' boxes above, with his best performance last year too. Craig Alexander - or so we thought - had retired from Kona competition after finishing 21st (8:43:59) in 2013. He raced Ironman Melbourne in March this year (5th, 8:05:47) saying his "body is a rental car and I’ve been racing with the handbrake on" - before surprisingly indicating to us at Ironman UK that he may be returning to Kona. Can he make it four career Ironman World Championship wins? His last Kona victory was three years ago, and he's now 41 years old - he's everyone's favourite, the "pro's pro" and much more - but statistically, it must be a long shot as 12th and 21st over the past two years goes against all of the trends above. He does however have that 'previous winner' box ticked - three times! Pete Jacobs also ticks the 'previous winner' box and doesn't turn 33 years old until late October - in Ironman terms, he's a youngster. However... he was 32nd male Pro last year (9:06:39) which, if we are going to apply this approach (! ), suggests that he won't win this year, as only once in the last 25 years has an athlete had a 'bad' race (and even then, it was a puncture impacted DNF for Normann Stadler in 2005), to return the following year and win. Ok, so let's say you've raced before but haven't yet won Kona - who has finished fourth or better, and starts this year? Luke McKenzie. Little (nothing?) else is an indicator of future Kona success more than past Kona results. McKenzie certainly surprised almost everyone with a superb race to second place last season to add to his ninth in 2011. That shows the progress of a potential future Ironman World Champion - but will, like Chris Lieto, Andreas Raelert, Cameron Brown and Eneko Llanos, second proved to be the best it gets for McKenzie? I don't know - but statistically, he has to be on the 'potential winners' list given his best ever result was a podium last year. Sebastian Kienle. Fourth in 2012, third last year. Two years ago in a similar analysis I said that Kienle couldn't win Kona first time out. That's not the case now - he is on the progress path of a potential champion, and winning Ironman Frankfurt in Sub-8 hours only adds some 'form' to these stats. A potential winner this year, absolutely no question about that. James Cunnama. A Sub-8 hour iron-distance finisher and Challenge Roth winner in 2012, Cunnama produced a superb performance in 2013 to finish fourth. That marks him out as having winning chances - though, perhaps slim in 2014, given that only once on the last 25 years has a 'previous best of fourth' been enough to indicate a winner. Andreas Raelert. 3rd/2nd/3rd/2nd over four seasons (2009-2012), the Raelert assault on Kona came to abrupt end last year with an injury related DNF on the bike. 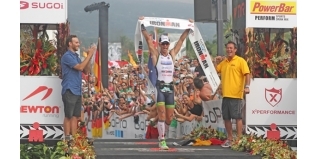 Andreas gained his Kona spot late in 2014, following a rolldown from a withdrawing athlete. His form of late has not been at the levels that had many calling him the 'best athlete never to have won Kona (yet)', and late confirmation of entry can't have helped. At his best, he certainly has the class and talent to win - but are his best days behind him? Based on the 'last years result' statistics, it is is difficult to single him out as a potential winner this time around - even if writing off the iron-distance world record holder based on statistics seems madness. Marino Vanhoenacker. Less than a minute behind Andreas in 2010, DNF in both 2011 and 2012, DNS in 2013. After six consecutive wins and an Ironman record at Ironman Austria, Marino took a different direction in 2012 and headed to Frankfurt to take on the best of the German's on their home patch... and won, leaving Sebastian Kienle and Andreas Raelert behind. With no Kona start due to injury and point in 2013, Vanhoenacker has been working his way back to full fitness in some style, winning 70.3 Luxembourg, Ironman Canada and 70.3 Salzburg of late. A fit and healthy Vanhoenacker is one of the best athletes in the world to watch - and I'm a huge fan. However... this article isn't about assessing form lines (or even my 'opinion'), it's about trying to apply statistics... and they suggest his winning chances are very slim with a best result at Kona dating back four years. Eneko Llanos. 5th in 2006, 7th in 2007, 2nd in 2008, 7th in 2010 - has the Llanos 'window of opportunity' slipped by on the big island? Llanos is a threat, but six years since his Kona best finish - on this analysis - suggests his winning chances are slim. Ronnie Schildknecht. The master of Ironman Switzerland, but a previous best of fourth combined with a six year gap since that result suggests that Ronnie will need to produce something outstanding to win - so statistically, I can't predict that here. Potential winners from this group then: Luke McKenzie, Sebastian Kienle, James Cunnama. 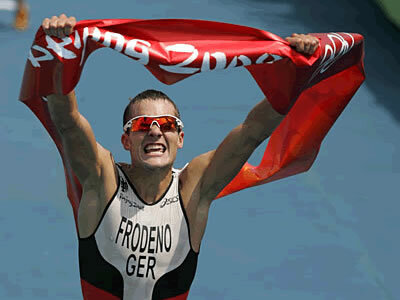 Jan Frodeno. Little in any sport comes bigger than an Olympic Gold medal, and Frodeno has one of those on his C.V. from Beijing in 2008. He's been a revelation at the Ironman 70.3 distance over the last 18 months, recently finishing a close second to Javier Gomez in Mont Tremblant. His Ironman experience is limited to one race, Frankfurt this year. He had two punctures there, cramps on the run... and still finished less than seven minutes behind the current Ironman World Champion with an 8:07:05 at his first attempt, for third place. Frodeno has historically struggled in colder conditions, so that won't be an issue for him in Kona. It's a big ask for anyone to win the Hawaii Ironman at their first attempt - but Frodeno comes with the tools that indicate he shouldn't be ruled out - even if history suggests the chances of a win first time out are small. Anyone else to consider in this section? I don't think so - not if we are assessing winning potential for 2014. Nils Frommhold (GER) should go well, but expectations of a debut win are surely too much. He's one for the future.